Snowfall is a beautiful natural phenomenon to experience and witness. Little flakes fall from the sky and melt in your hands. It is the time to go out and play with your friends. To make snow angels and have snow fights, to creating a snowman and going snow diving, it truly is the weather to enjoy. But after every play time, comes the responsibility to clean up. Similarly, it is a very hard task to get rid of the snow after you are done enjoying yourself. Slowly, the large amount of snow turns into a nuisance and creates trouble for the society and its residents. Removing snow from driveways and sidewalks is a very tough job. When it has been snowing for hours, a deep layer of white can form over the world outside. It is a huge chore to get rid of the snow and clear the front of your house. Luckily, this article will give you some tips and precautions for just this time of the year. Follow these tips, and hopefully, your winters will become easier to bear. Before you even think of the tools you are going to use or a shortcut which may ease your job, it is necessary to take care of your own protection first. The cold weather can make you fall sick and can affect your busy life very negatively. Low temperatures can cause diseases like cold, flu, and extremely low temperatures can lead to hypothermia. Before you go out, make sure that you have enough warm clothes on to offer protection from the harsh winter. Any task you do, you should keep your health as the topmost priority because truly there is no life without health. Wear thick boots with woolen socks to keep your feet warm. Before going out, remember to layer up. Wear a sweater with a warm shirt underneath. Take a coat on top. The heat of your body is lost through your head and your ears. Keep a hat on. Invest in ear muffs. Wear light layers so they can be easily taken off. Once you start working, the exercise will take a toll on your body, and you will feel warm. Remember you are going out to work. Make sure your clothes are not uncomfortable and do not restrict you from moving freely. 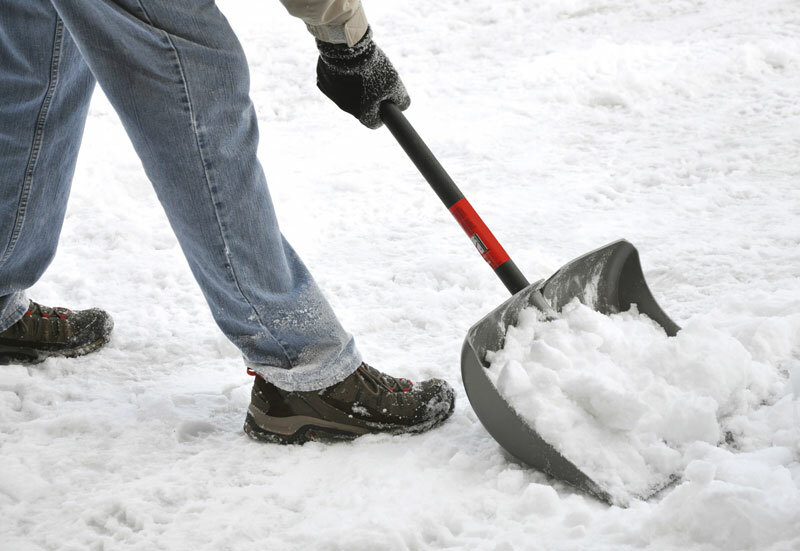 What Are The Right Tools To Shovel? When it comes to taking off the snow, what matters even more than the strength of the person is what they are using to remove the said snow. Paying attention to the tool is important. For every person, the perfect tool will differ. When choosing a shovel, make sure that it compliments you, and you are comfortable with it. The height of the shovel should be according to your own. If you need to bend too much or stand up on your toes to get the shovel to move smoothly, then you are using the wrong tool. Get a new one. There are mainly two types; plastic and metal. Depending on your weight, choose the one which works best but which you are easily able to lift. As the added weight of the snow, if you cannot easily handle the tool empty, it will be nearly impossible to lift it with it. When getting a shovel, try to get the one which works pushed rather than lifts. It is easier to push the snow to the edges then to lift it. Once the snow has been pushed to the edge, it gets out of your way without you giving much effort. How To Keep Snow From Sticking To The Shovel? The most important part of clearing the snow from your part is to ensure that you are using the best tool suitable for the job. Purchase a shovel which is non-stick. This will prevent the snow from sticking to the tool and will allow it to be easily thrown off when in the process of working. To further soften the snow, sprinkle salt on it. Salt helps by lowering the melting point of the ice. It acts as an impurity. Hence snow is turned to the liquid state at a much higher temperature than originally expected. Water acts as a lubricant and does not allow the rest of the snow to stick to the shovel. This step makes your work a lot easier, and since salt doesn’t have such a high price, it is not too heavy on the pocket. How To Spend Time Efficiently When Working? Shoveling is an intense exercise. It can cause strain on your muscle and cause them to rupture badly. This can be very dangerous to your health. Stand up straight and bend over to touch your toes without letting your knees bend. Raise your hands to the sky, stand on your tiptoes and pull your body towards the sky as much as you can. Spread your legs far apart and use your right hand to touch your left foot. Do this alternatively, changing sides. These will prepare your body to handle the weight and the exertion that is to come. Work smart rather than hard. When snow falls, it may be a lot of inches deep. Rather than lifting the whole thing at once, try to go layer by layer. Firs, lift up some amount then work your way down. This will lessen your weight and will result in you doing your work efficiently. What To Do After You Are Done? After you are done with your work, make sure to stretch again. Get your body back to the resting state. Make a hot cup of milk and drink it. This will help bring warmth back to the body. The milk will also provide strength to bear the workload. Make sure to eat something healthy. Cut open your favorite fruits and enjoy them. Fruits are the most natural and best source of energy you can get. And now that you are done with the most tedious part of experiencing a snowfall, recount and enjoy your experience, and count the days to when the next one will happen.